DENVER, Colorado, November 14, 2013 (ENS) – The United States today destroyed its six-ton stock of confiscated elephant ivory, sending a message that the nation will not tolerate wildlife crime that threatens to wipe out the African elephant and other species around the world. At least 30,000 elephants were killed last year for their tusks. 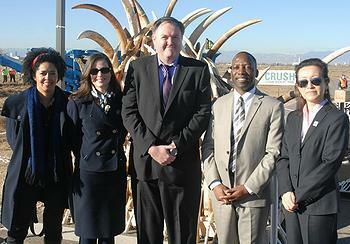 The ivory was pulverized by an industrial rock crusher in front of some of the world’s most influential conservationists at the U.S. Fish and Wildlife Service’s National Wildlife Property Repository on Rocky Mountain Arsenal National Wildlife Refuge near Denver. The event was witnessed by representatives of African nations and other countries, dozens of conservationists and international media representatives. It is the latest in a series of actions by the Obama administration designed to crack down on international poaching and illegal wildlife trafficking. The Service accumulated the ivory destroyed today over the past 25 years, seizing it during undercover investigations of organized smuggling operations or confiscating it at the U.S. border. 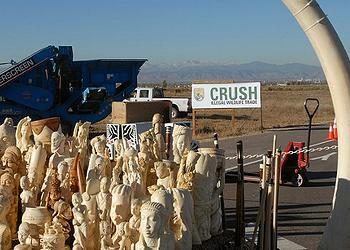 Most of this ivory was destined to be sold illegally in the United States or overseas. Although it is difficult to put an exact figure on the number of different elephants this ivory represents, it certainly numbers in the thousands, officials said. “The United States is part of the problem, because much of the world’s trade in wild animal and plant species – both legal and illegal – is driven by U.S. consumers or passes through our ports on the way to other nations. We have to be part of the solution,” said U.S. Fish and Wildlife Service Director Dan Ashe at the event. In the last 10 years, an estimated 11,000 forest elephants were killed in Gabon’s Minkebe National Park alone. During that period, the total population of forest elephants plummeted by some 62 percent across Central Africa. Elephant massacres have taken place in Chad, Cameroon and the Central African Republic in the past year. Well-armed and organized criminal enterprises have taken advantage of insufficient protection capacity in remote areas. African elephants are listed as threatened under the U.S. Endangered Species Act and are protected under the African Elephant Conservation Act. Globally, trade in elephants and their parts is regulated under the Convention on International Trade in Endangered Species, a global agreement through which the United States and 178 other nations work to protect species at risk. The ivory fragments left by the crusher today will be stored temporarily at the Service’s National Wildlife Property Repository. The agency is working with the Association of Zoos and Aquariums to identify how best to use this material to increase awareness of the global poaching crisis and commemorate this historic event.